First and foremost, Liam Gallagher's coming back to the City of Iron. After his last festival appearance with the legendary Oasis in 2009, he's back with his new band Beady Eye to perform a one-off festival gig in Germany. Also Melt! Selektor Stage is taking shape with Modeselektor themselves at the helm. Meanwhile Big Wheel Stage sees an Ostgut Ton Special coming. Describing the highly anticipated Beady Eye debut, Liam Gallagher certainly raised the bar high. Different Gear, Still Speeding is filled with songs „as good as Definitely Maybe,“ he told the NME. Yet, what the title promises is definitely what you get. After Oasis split in 2009, Liam Gallagher and his band mates Gem Archer, Andy Bell, and Chris Sharrock simply had to get back in the studio, taking it a step further by using the newly formed Beady Eye as their creative outlet. Compared to Oasis, Beady Eye might only be a four-piece, yet the band’s in-your-face attitude is all the more rock'n'roll. The album’s edgy, rough and pure, conquering the next level of Britpop on its way. You get the anthem-like classics („The Roller”), fast forward smash hits („Four Letter Word”), and such retro pieces as „World Outside My Room“ in 60s guise on top. If that’s not enough proof for you, wait till you see them live. Our Melt! Selektor Stage is taking shape with Modeselektor watching over the goings-on in all their manifold glory. After their spectacular live set together with Bonaparte in 2010, the Berlin-based Gernot and Szary will top last year's show with a never before seen and heard techno supergroup. Under the name of A.T.O.L., Modeselektor will get behind the turntables together with Marcel Dettmann and Shed (Ostgut Ton) to present their vision of techno to the Melt! crowd live. Also joining the stage's line-up, which is curated by Modeselektor in close collaboration: Nicolas Jaar live, who's fanbase stretches from techno to indie lovers. With a new album in tow, Apparat Band joined the bill. So did Jamie Woon, Rusko, Siriusmo, Anstam, Cosmin TRG, Phon.o and Benjamin Damage & Doc Daneeka. A perfect addition to the already confirmed SBTRKT, Gold Panda, Sizarr Soundsystem and Housemeister. A line-up to be proud of. Ostgut Ton, Berghain and Panoramabar’s in-house label is back. Last year, label brought its manifold soundscapes to the Sleepless Floor going quite a bit back to the roots. Even in the beginnings of Melt!, many of the label’s DJs coined the sound of Ferropolis. In 2011, this will be no different. 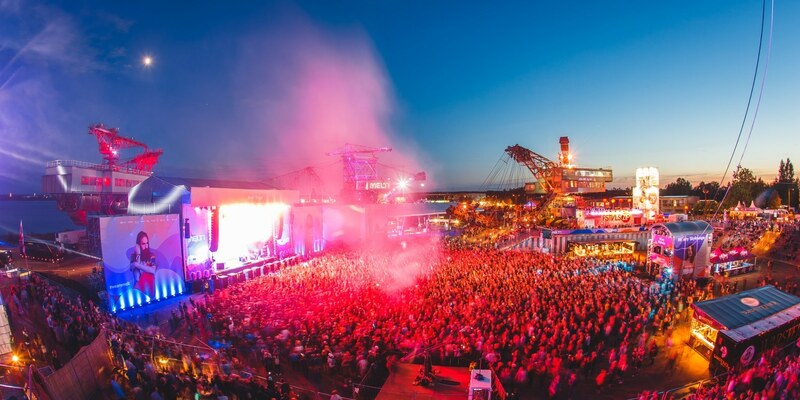 Besides Marcel Dettmann and Ben Klock, Marcel Fengler as well as Barker & Baumecker (live) will travel to Ferropolis to conquer the Big Wheel Stage this year. In the spirit of Ostgut Ton, the four acts are about to present the genre diversity the electro label, which celebrated its fifth anniversary last year, is known for. From the power station to the steel giants – Melt! is looking forward to a reunion with Ostgut Ton. If you have been longing for more guitar-driven sounds to be announced, well, here you go: The Drums will be playing their only festival show at Melt!, and so will the indie legends of Swans. Iron and Wine's performance promises to be a truly intense experience as much as the gig of Edward Sharpe & The Magnetic Zeros. With Foster The People, we have another Melt! office top tip for you. We are also looking forward to the appearances of Crystal Castles, FM Belfast, the Le Tigre spin-off MEN, the return of Dananananaykroyd, and Planningtorock, who will be performing her spectacular new album W (20th May/Cooperative Music). Also on the bill: Ben Drew a.k.a. Plan B, who will arrive from the UK with a little Motown feel in tow. After a bit of a Melt! break, we are looking forward to the return of DJ Koze. For all of you waiting for hardpaper tickets to be available, here they are! as of now, hardpaper tickets will be available via our website as well as in selected ticket shops as of next week.